It’s summer and those book bags are filling as readers make time for reading, whether at the beach, on vacation, or taking a plane somewhere exotic. This is the start of Auntie M’s special Two-fer recommendations to keep you turning pages. First up is UK author S J Bolton, author of Sacrifice, previously reviewed. Her first three novels are all stand-alones so you can read these in any order without losing a character thread. Bolton’s next two offerings follow her debut only in terms of mining folklore and mythic tales for her modern gothic thrillers. 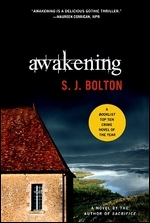 Awakening was a Booklist Top Ten Crime Novel of the Year. Totally riveting, Bolton’s story unfolds with an opening shudder:rescuing a baby from a snake; and a death after a snakebite. Clara Benning is the reclusive veterinary surgeon whose expertise is called upon, and who finds herself unwillingly involved when it’s determined the man’s venom concentration was artificially constructed, leaving his murderer to be very human. Clara’s reclusive streak is down to a childhood accident which left has with a facial disfigurement. Her reticence to become involved is slowly eroded when snakes start to appear in volumes in the homes of the villagers she serves. Intrigued and concerned, Clara starts to investigate, with the help of an eccentric expert in reptiles, and a neighbor whose intentions are not what they seem on the surface. As she uncovers an ancient ritual and then an abandoned house, the tension climbs, and it soon becomes obvious that a decades-old secret lies at the heart of this mystery. Not being a snake fan, I was surprised at how quickly I read this book–it’s that good. The second offering is my personal favorite of her books so far, and the one I’m hoping to see some of her characters appear in a sequel. 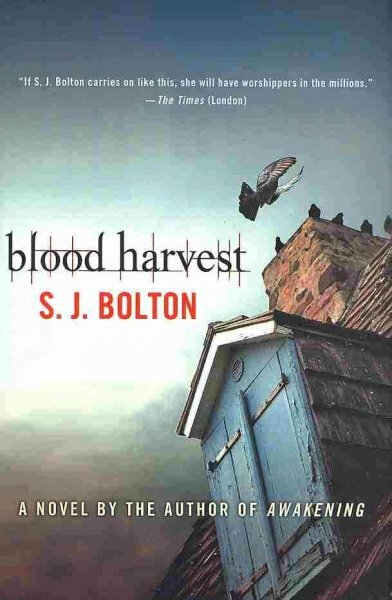 Blood Harvest takes the reader to Dorset and a small village on the moors that ought to be a paradise for anyone who settles there. The Fletcher family has built a beautiful new home between the newer and oldest churches in Heptonclough and someone seems determined to scare them away. Childish pranks give way to serious threats with increasing danger to the three children in the home. The most affected is the oldest, Tom, a bright ten-year old who frustrates his parents when he begins to believe someone is watching them. Therapist Evi Oliver is called in to examine and treat the boy. Also serving the villagers is a new vicar, Harry Laycock, and between the two of them, they try to salve the villagers fears. Then Evi uncovers the mysterious deaths of three toddlers from the town over the last ten years, and the emerging pattern becomes a nightmare that threatens to be repeated. Against a race of time, Evi and Harry hurry to unravel an evil killer in their midst and save the lives of the Fletcher children. Evi and Harry have wonderful dialogue and repartee and are the two characters I am hoping Bolton will resurrect in another novel. Thank you for your comment on my poem about my mother’s poems, Marni. OK, now I’m going to reveal my low-tech abilities and ask this question: When you comment about something on my blog, as you just so kindly did, what is the best way for me, then, to comment on your comment? What I did was to click “Reply,” but I’m not sure whether you get it, or whether it just appears on my own blog (which, of course, is unnecessary). That’s why I’m also putting it here. Sorry to be so low-tech. Not at all. When I reply, there is a button I can hit which will give me in my email any other comments on that blog. Sometime I hit it and sometimes I forget to….so if you added a comment there, I wouldn’t know UNLESS I’d remembered to hit that button before I left your blog. I wonder what’s the way around that myself? And trust me, I’m almost as low-tech as you are!! Let’s try this: I’ll post a comment on Do It NOW and NOT hit the button. You go in and add a comment reply and we’ll see tomorrow if it came to my regular email inbox, that’s how I’m getting your blogs. I signed up early on to get them delivered to my inbox, but then I comment onto your blog. Let’s try it out~then we’ll both know!